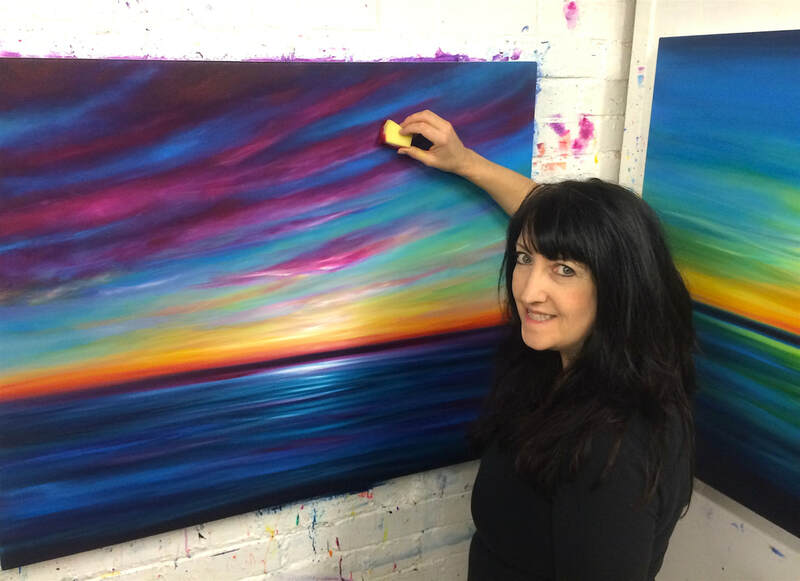 I am an abstract painter inspired by nature and music, particularly land and sea. 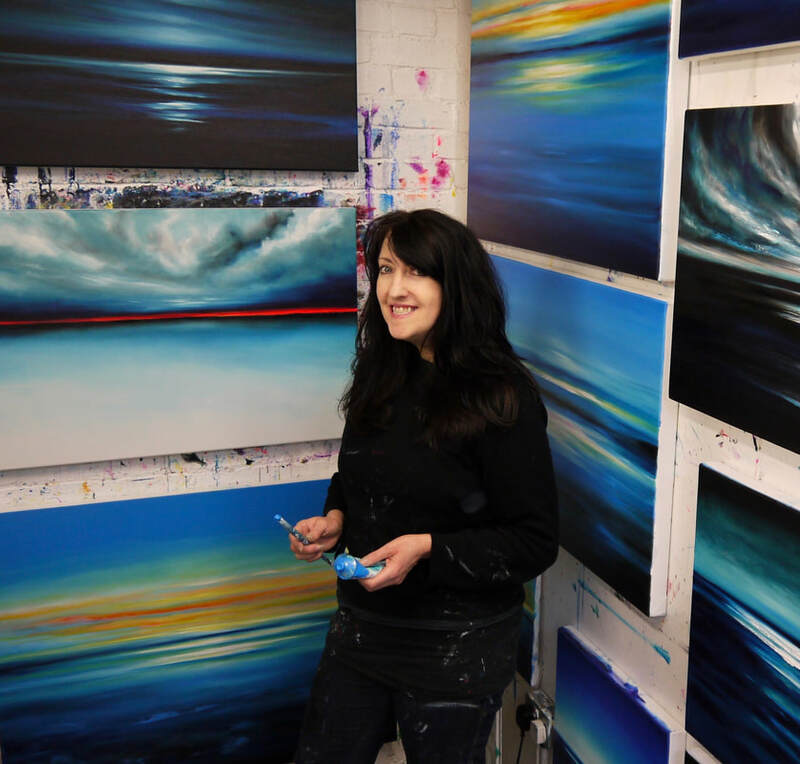 My latest paintings are abstract seascapes using colour to express light reflecting onto water. I always listen to music when painting and feel that this has a strong influence on the finished work. I’ve chosen song lyrics from Joni Mitchell, Neil Young, Crosby Stills & Nash, Bob Dylan, The Beatles, The Rolling Stones, The Kinks, Pink Floyd and David Bowie amongst others to title my paintings. I feel that a snippet of a song lyric as a title gives the painting extra depth. Lyrics often jump out at me when I'm painting and seem to fit the artwork perfectly! My paintings are all available to purchase through the gallery page on this website and all come with a Certificate of Authenticy. I'm always happy to help so if you have any questions please email me at juliaeverettart@gmail.com or phone 07711 308 168. Delivery within the UK is FREE and Worldwide shipping can also be arranged depending on size. Paintings are despatched same or next day and should arrive within 2-3 working days. I can personally deliver within the M25 for speed and safety at a time slot that suits you. If you live in or near London and would like a special same day delivery or evening or weekend delivery please contact me as this is often possible. Deliveries outside the South East are sent by trackable courier, usually by Parcelforce's 48 hour service. ​I aim to offer excellent customer service and want you to be completely happy with your new painting. I offer a no quibble money back guarantee & paintings can be returned within 14 days for a full refund. Payments are taken through a secure server and you can pay securely with credit card or paypal. When I despatch a painting I always send a personalised card and a complimentary set of 3 hand made greetings cards as a thank you. If you are thinking of purchasing a painting for a gift and you'd like me to write a personalised gift card to go with it, please let me know who it's to and what occasion it is, and anything particular you'd like me to say and I'll be happy to include it with the painting. Many of my paintings are inspired by light on water. I have always loved the sea and my childhood holidays were spent in a caravan in Wales, where we spent a lot of time on beautiful windswept beaches looking at the ocean and sheltering from the British Summer. I went to college in Brighton to do my BA in Fine Art, where my love of the sea grew and I now try and spend as much free time as I can contemplating the coast, despite living in London! The Welsh coastline is still very special to me, as is Cornwall, which is now one of my favourite places in the whole world to visit and watch the light change on the sea. Many of my paintings are inspired by Prussia Cove in the wild West of Cornwall, a place I return to year after year. I am available for commissions so please contact me if you would like me to paint a special painting for you. They usually take about 2 to 3 weeks (including drying time). I'm happy to advise about what might be right for your home and can send you updates and photos of the artwork for you to comment on during the painting process. We can work on them together! I want everyone to be completely happy with my paintings and they all come with a 14 day no risk money back guarantee too. 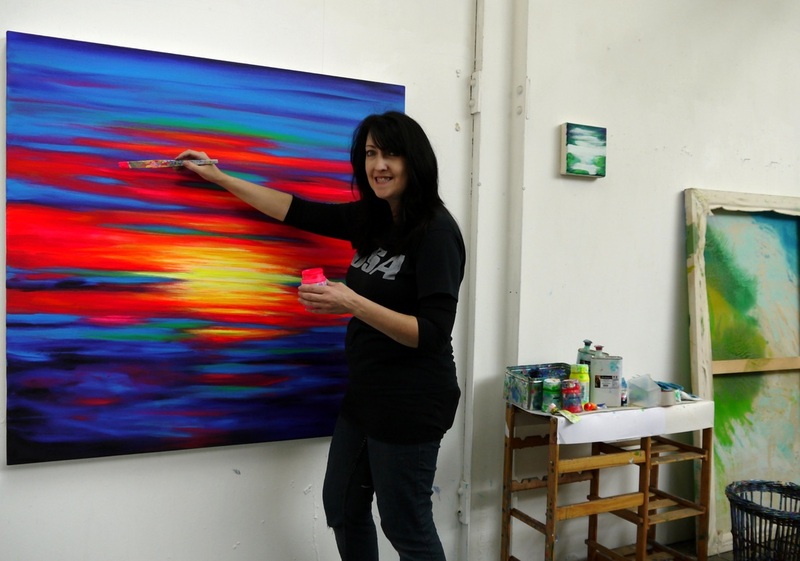 If you would like to visit my studio to see the paintings in real life, please get in touch. I am based in Hammersmith, West London.